Dave has had this meter in his range for a good number of years. One can purchase kits, accessories and fully assembled products. I went for a self-assembly kit, which I purchased at the Heelweg meeting in January 2013 (which incidentally was once again a very successful event). The kit was delivered with an aluminium housing. The housing requires some additional holes making in it for switches, probes and a 12V power jack. These can all be drilled. What also needs to be cut out is a rectangular hole to accommodate the display. This requires a bit more work than simply drilling. In the documentation Dave has included a template with which one can easily identify the correct position for the holes. Simply cut out the diagram of the front panel and stick it to the front of the housing with Prit-Stick, then take a center punch and a hammer and mark where the holes are to be drilled and the corner points of the display-hole. Remove the paper and wash glue residues from the front panel with some water. The same can be done on the side panel where 2 holes need to be drilled. No more mechanical work is required with the possible exception of ensuring good fitting of the PCB. My PCB was slightly too large and could not initially be slid into the housing. Below are some photos of the kit, the front panel of the housing and the completed meter. The housing front panel, with all required holes cut. The rectangular hole for the display was made using an adapted junior hacksaw blade. I punched out the pin at the front-end of the blade and cut away a piece of the top of the blade (with tin-snips) so that only a narrow bit of the blade remained. A few 3mm holes close to each other can create a rectangular hole where one can start sawing; it’s a bit of a fiddle but is worth the effort. A few scratches here and there is not a problem; after assembly a yellow label will be applied over the front as a final step. I stuck it on to the front using double-sided tape. 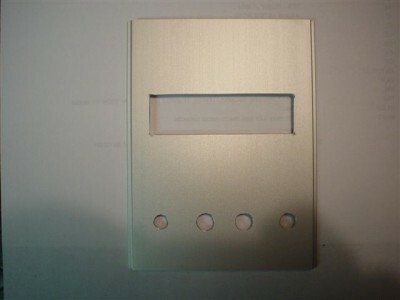 Once the housing is finished, all components can be soldered to the PCB, and the display attached as the final step. My kit only included 2 M2 bolts with spacers, although the PCB and display both have holes to accept 4 bolts. In any case, the display is securely attached even with only 2 bolts. 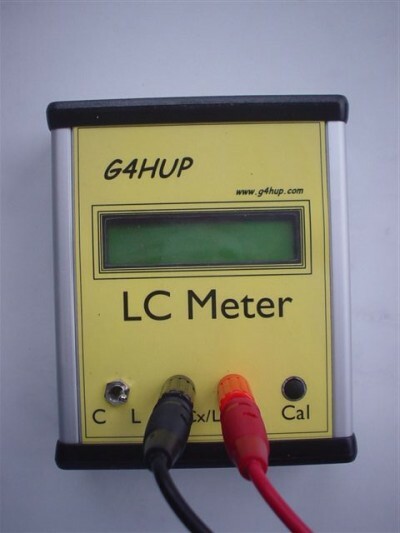 Once everything has been assembled and the switches and probes connected, power can be attached to the meter (from either a 9V battery or 12VG via the supplied DC cable) and it can be switched on. Don’t panic if you don’t see anything on the display, you probably just need to adjust the contrast, which can be done using the potentiometer next to the display. My unit worked well right from the start and didn’t require any bridging wires. 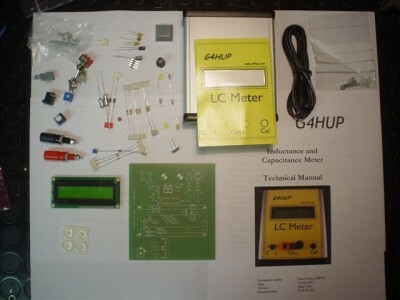 The completed meter. It more than lives up to the specifications. The maximum capacitance I could measure was 500nF (The specs state up to a max of 100nF). A capacitance of 1pF and induction of 1 microHenry can also be measured. A very nice meter which in my case demonstrated its usefulness within a week. Definitely recommended!